· 1990, Tim Berners-Lee created the internet. His invention changed the scenario as the WWW offered greater capacity, flexibility, immediacy, permanence and interactivity. · Chicago Tribune of USA began its online venture, the Chicago Online, in 1992. This is the considered the first online media. · On January 19, 1995, the first newspaper to regularly publish on the Web, the Palo Alto Weekly in California, begins twice-weekly postings of its full content. · Before June 1994 Nepal Academy for Science and Technology (NAST) and Nepal Forum for Environmental Journalists had used email services as trials. · Himal Media started archiving its publication, Himal South Asia, in its own website himalsouthasia.com in 1997. · http://www.newslookmag.com was established on 4 July 1999 as the first Online journal by Dharma Adhikary which provided link to largest collection of news of nepali events and public affairs. Later in 2005 it was re-established as http://www.nepalmonitor.com. The reason was the ban imposed by Royal Takeover on 2005 on which Fomer King Gyanendra was responsible. · On February 2000 kantipuronline.com was established. · On 12 September 2001 http://www.nepalipost.com was established. · On December 15, 2002 Kamana Group of Publications began newsofnepal.com. Lately all broadsheet dailies along with weeklies and smaller media are available online. · The first ever Blog in Nepal is United We Blog (blog.com.np), was established on October 1, 2004. Now let me put light on the different aspects of these websites and add some comparative views. Nepal Monitor renowned as "Nepal’s first online news magazine “was originally established as http://www.newslookmag.com in 1999 A.D from USA by a student named Dharma Adhikary as a part of his Online Journalism class in the Missouri School of Journalism at Columbia. Reuters.com is currently owned by Thomson Reuters but before 2008 it was owned by Reuters Group PLC which used to focus its information on Financial Market Data. Originally Reuters was established in October 1851 whose popularity rose later due to its act of publishing scoop news abroad. Today almost every major news outlet in the world now subscribes to Reuters’ services, which operates in over 200 cities in 94 countries in about 20 languages. — In July 1999, TIBCO Software completed an IPO on NASDAQ; Reuters retains a substantial proportion of the shares. Reuters announced, in early 2000, initiatives designed to migrate core business to an internet-based model. The foundation of online venture of Nepali times dates back to some 10 years ago tentatively in 2001. According to the web master of the nepalitimes.com Rubeena Mahato, the websites contains not only the content of it’s printed version but also it publishes longer and full-fledged form of media content with associated links. 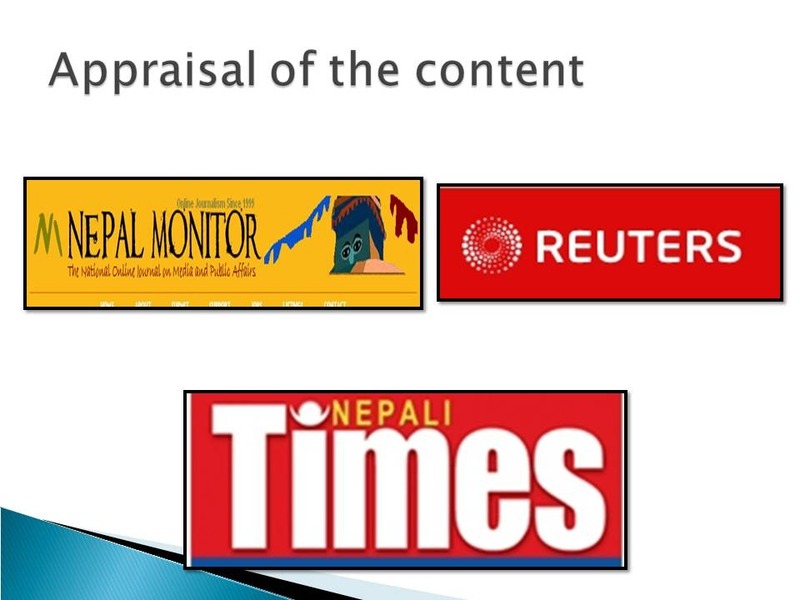 As stated earlier, Nepal Monitor was established as an individual project to fulfill the credit of online journalism class by a student in Missouri School of Journalism in Colombo. Besides that Dharma Adhikary, the founder of this website shares that the website was founded to make it "one stop center" for all the information regarding public affairs and analytical news-views of Nepal for Nepalese diaspora staying in America. "It was somehow fun-fun task"- whispers Dr Adhikary whose says that those day of starting a website make him feel nostalgic about his student life in USA. Whatever the objective Nepal Monitor was founded to serves before 2000, Today according to Dr. Adhikary The online journal is aimed at professionals (journalists and media entrepreneurs, academicians, development and cultural workers, lawyers, policymakers, administrators, etc)— people with expertise. It serves as a forum for the sharing of their expert views among themselves and among the wider public. In near future, Nepal Monitor will be institutionally mobilized as the important information dissemination mechanism of his recently established (2009) organization "Media Foundation" which focuses on media and public affairs and will cover any issues of significance to the public, whether they are governmental, community-related or entrepreneurial. Reuters.com is a multi-national news agency by Thompson Reuter which runs via global network communication. The primary objective of Nepali times.com is other than just digital archiving of it’s printed version. According to Rubeena Mahato of Nepali times, the media house receives numerious articles with assisting photographs and audio-visual material which is difficult to fit in the paper version so the online outlet has provided the readers with full version of the text with associated links, audio-visual material and added informations which can’t be included in the paper version. Blogs of Nepali Times Staff is another feature of the online venture of the nepali times. Nepal Monitor publishes annual report of multi-national organization like Asian Development Bank and UNESCO which expresses serious concerns for the current affairs of Nepal. For example recent report published by Committee for protecting Journalist (CPJ‘s) 2010 Impunity Index shows that in Nepal Seven Murders of media personal were unsolved. Similarly it doesn’t publish entertainment news nor do photos like Nepali Times and Reuters. Follow up stories on media controversies or journalistic attack events and timely interviews with media persons are updated in Nepal Monitor. Its contents are more like semi-academic or research based texts which are eligible to get published in journals. Nepal Monitors provides links to the important ministries, film industries offices, governmental and non-governmental institutions, colleges and universities of Nepal etc. It’s more like a spot from where people access becomes wider and more systematic. Nepali times published politico-analytical article by hiring experts and columnist throughout the national and international boundaries as well depending on the area covered by the article. Its contents are of more diversified in regard to the feature and photo-stories related to socio-economic, political, international, and national and opinion poll surveys. Also its vacancy spot increases its demand among the readers. The staff writers are allotted with their personal blogging and the editorials have a profound impact on the people as well. Moreover, the paper covers lifestyle, health and environmental issues along with the international relations and public affair. Its outreach has extended up to a page in face book. Nepal Monitor is an individual venture by Dr. Dharma Adhikari with the information input from other journalists as well. Nepal Monitor.com does not have any external sources of revenue apart from Dr. Dharma Adhikari’s personal contributions for the Annual registration of the site’s domain name which accounts for $10.00 per year. The lack of manpower has created an impediment to the revenue process as there are unable to include the advertisements. Hence, its contributors are freely volunteering in the website. Nepali Times.com is a sefl-sustained online websites because according to Mahato of Nepali times, the websites receives revenue from advertisement placed there which has nothing to do with placement in the paper version. Nepal monitor.com is registered from Los Angeles (LA). Albeit, the domain name is registered from abroad, its web space is embedded in movable type. Nepali times.com is registered in Nepal. Reuters.com is registered in it’s headquarter city London. Nepal Monitor.com has a 6 – member co-editorial team who contribute their analytical and perspective articles irregularly. Articles are published on a rolling basis. The journal is published and edited by Dharma Adhikari. 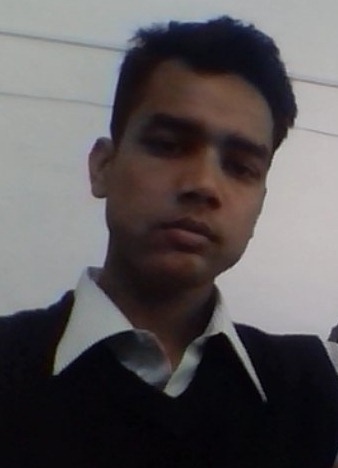 Co-editor is Chiranjibi Kafle. The core team of volunteers includes Krishna Sharma (staff writer), Babu Ram Fyuba (research), Prabhat Kiran (research) and Chhabi Adhikari (IT). Nepali Times has mobilized a full time staff for uploading content on web apart from other technical stuffs. Rubeena Mahato of Nepali times states that she has been uploading content on web in coordination with other editorial members from paper versions. Online section of Nepali Times receives content via email and then it is uploaded by a online staff. Nepal Monitor manages its website published content through sequential process. First the topic for writings is suggested to the contributors then it is accessed in terms of viability and then drafted and edited thoroughly. At times articles are rejected when the sufficient facts and figures along with proper citations are missing. The Nepal Times organizes weekly- board meeting before setting out in print and online. A staff is mobilized full- time for updating the content. The editors of the print version participate in the online- editing process as well. Reuters.com is an international media house which mobilizes its team members in the various parts of the world along with collaborating with the local media. Nepal Monitor has its commentary box for immediate feedback. Also, Dr.Adhikary organizes a weekly discussion program on its published content and serious issues. He often entertains telephone feedback and queries from the readers. The Nepali times.com has the letter to the editor along with email feedback services. One of the noticeable feedback mechanisms is its filtering process of comments. Nepali times receive comments national and foreign readers from different corners of the world but all comments are not accepted. According to Mahato of Nepali times, the comments which projects racism, individual anger or against nationalism etc are not accepted. Nepal Monitors targets professionals (journalists and media entrepreneurs, academicians, development and cultural workers, lawyers, policymakers, administrators, etc) — people with expertise. And also the aspiring journalist who want have real craze in this journalism sector. Reuters: International financial business organizations, citizens, institutions, Foreign market throughout the world. Nepali times target diplomatic communities, foreign readers, and Nepali diasporas. 1. Geographical coverage: Nepali Times.com focuses more on the national news then on the international issues. Nepalese living on Diaspora are also highlighted. Nepal Monitor.com is more specific in terms of its coverage as it only deals with the media-related and academic and scholarly articles. Reuters.com being an international media house believes in the diversification and the world-wide dissemination of information relating to various genres. 2. Diversity of issues: Nepali Times.com highlights the national, cultural, environmental, health, sports, and travel and Nepalese lifestyles. Nepal Monitor.com highlights the peace-building, serious and developmental issues related to the nation by giving a global perspective. Reuters.com has a vast coverage in terms of its content, scope and nature of the issues. The burning global issues are highlighted. The showbiz and entertainment section is explored at great depth. if you have time plzlog on to our web page http://www.laxmipratisthan.org if you like our video please share it among pupil that will be great contribution for our organization . have developed some nice practices and we are looking to swap solutions with others, why not shoot me an email if interested.